The longer I write these letters, the more I realize how often I lean on music to convey my thoughts to you. And I’m not a musically-inclined person. I wasn’t in chorus or band. I don’t play an instrument. I’m not a gifted singer, and my wife says my recollection of lyrics is routinely off the mark. I never bought cassette tapes or CDs when I was younger, and I don’t use iTunes or Spotify. Nevertheless, I like music. All kinds. I’m a music freeloader. I’ve absorbed enough music over my life by listening to the radio, movie soundtracks, and my brother’s collection that it’s easy for me to relate specific songs to my life. It goes without saying that I’m not unique in this regard. Music is a common currency of expression. I have found that nothing captures the wavelengths of an Intrepid investor better than country music. “Friends in Low Places” was released by Garth Brooks in 1990 and is one of the most popular country songs of all time. I love it. It describes an uncouth fellow who shows up uninvited to his ex’s wedding and proceeds to drown his sorrows in whiskey and beer. Huge party foul, but the tongue-in-cheek lyrics are instructive. In life, it’s nice to have influential friends who can pull a string or two, but many folks aren’t advantaged by a powerful social network. They’re stuck associating John Q. Public and the so-called crumbs of society. This, for many, is a blessing in disguise. Applied to the investing world, most investors take comfort in owning blue chips, FANGs, and highflying winners of the performance derby. This is natural behavior and has material benefits including owning many great businesses and outsourcing your stress by investing with the herd. Unfortunately, you often pay a big price for a problem-free investment. At Intrepid, our aim is to buy a good business at a good price. For the last five years, it has been tough to meet both criteria, especially since we are unwilling to pay up for uncertain growth. As a result, we have found ourselves investing more like Lady Liberty: “Give me your tired, your poor, Your huddled masses yearning to breathe free.” We’re bottom feeders with noble intentions. We want to make you money without exposing your portfolio to undercompensated risks. To accomplish that, we’ve gone hunting in the deepest, darker corner of the markets: the 52-week low list. We’ve made friends in low places. During the past three years, the Intrepid Endurance Fund (the “Fund”) purchased 11 new securities that comprised at least one percent of the Fund’s assets. Each of these positions was acquired within 20% of the security’s 52-week low price. We started buying, on average, up 8% from the bottom and down 35% from the 52-week high. 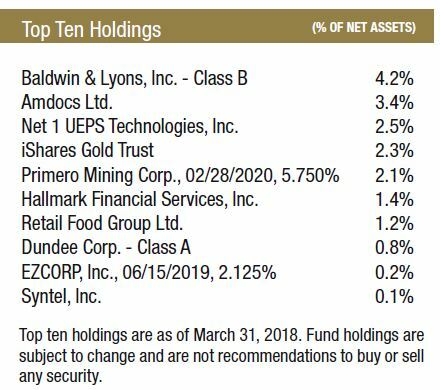 On the chart below, we show the average performance for these 11 securities in the year leading up to our initial purchase as compared to the performance of the Russell 2000. The period doesn’t correspond to a specific year, since different stocks were acquired at different times. However, it does show you the average price trend for our purchases in the months, weeks, and days leading up to our initial activity. As you can see, we buy out-of-favor stocks. *Time period is relative to purchase date and varies by security. Please see commentary for further explanation. Please allow me to end the suspense: we rarely buy at the absolute bottom. Usually, stocks keep falling after we buy them. Many investors would prefer to wait for a demonstrated recovery before stepping into a sticky situation. We are not those investors. We buy when we see value and we kick ourselves if we have to pay more for something that we thought was cheap at lower prices, unless the reason for the delay was the time required to complete our research. We can anticipate the arguments against this approach. First, a 52-week period is an arbitrary time horizon. Agreed. Just because a stock is close to its 52-week low doesn’t mean it has been kicked to the curb by investors. We ran the same analysis going back three years before our initial purchase, and the core findings were the same. 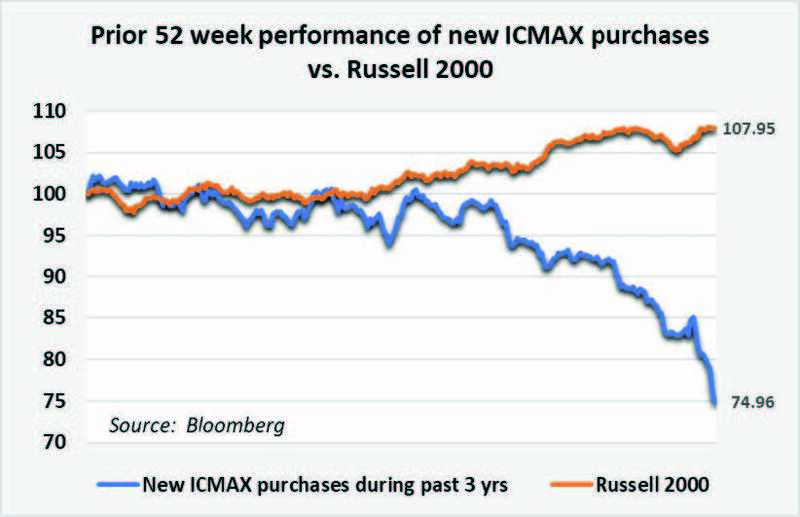 Our basket had declined more than 20% over the three years before our initial acquisition, while the Russell had increased 35% over the same relative stretch. Are we foolishly specializing in catching falling knives to make ends meet in a challenging period? I don’t think we’re fools, but we are playing with sharp objects. Scavenging the new lows list lacks glamour and can be dangerous and stressful, but it’s also potentially rewarding. Of the 11 new names the Endurance Fund has acquired during the past three years, eight are higher today than they were when we started buying. Four of these have been taken over by other companies. Three names are trading lower than our cost basis; however, all three were purchased in December 2017—an insufficient time frame for our theses to play out, in our opinion. In fairness, the market’s upward trajectory has provided a great deal of underlying support to most stocks. However, we believe the firms plumbing new lows over the relevant time period are more likely to be even lower today than the typical guilt-free stock. We’re satisfied with our overall outcome in sorting through these maligned businesses because we think it’s created a portfolio with more idiosyncratic risk and less correlation with the market. The last argument against rummaging through the bargain bin is that price is only one factor in the investment equation. Price without value means nothing. Surveying stocks with weak price action is only a starting point for us, and every purchase we make is predicated on a stock’s price trading at a discount to our estimated intrinsic value. The valuation is determined by a considerable amount of research. Sometimes we are wrong. Often, we are early. But we are never careless. The markets were rattled in the first quarter from concerns over trade wars and sputtering market leadership from technology megacaps. Major indexes ended the period down mid-to-high single digit percentages from their all-time highs but essentially flat year-to-date. As female country singer superstar Shania Twain once said, “That don’t impress me much.” For those kind, patient souls who have stayed committed to the Endurance Fund through this cycle, the understandable reaction on down days is to inquire whether we are finally putting money to work. However, when index levels were 5% to 10% lower on the way up (i.e. two months ago), we weren’t finding much value then either. Valuations have been at all-time extreme levels. We buy stocks when we think we can acquire them for less than fair value, not because they are falling. We’re keeping in mind the famous order from the battle of Bunker Hill: “Don’t fire until you see the whites of their eyes.” Even with the assistance of the Hubble Telescope, an all-out assault on our cash reserves feels premature. The Fund ended the first quarter with 81.8% of its assets held in cash equivalents. Our first quarter performance was poor. The Fund declined 1.98% in the three months ending March 31, 2018, compared to a -0.08% change in the Russell 2000. For the same period, the Morningstar Small Cap Index decreased 1.58%, while the S&P Smallcap 600 increased 0.57%. If you extended the measurement period by an extra trading day, the Fund’s performance is roughly in line with these indexes year-to-date. Nevertheless, we don’t want to sugar coat a poor outcome for a cash-heavy fund. Our first quarter decline was disappointing and is primarily attributable to disappointing results for two holdings, Retail Food Group (ticker: RFG AU) and Corus Entertainment (ticker: CJR/B CN), which were partly offset by great news for a third holding, Primero Mining (CUSIP 74164WAB2). We discussed Corus in our last letter to you. In January, the company released results for its fiscal first quarter. Corus’ television advertising revenues are falling along with its Canadian peers. Since the company acquires most of its content from U.S. media companies, we think Corus will have a tougher time navigating a future transition to a direct relationship with consumers. We sold our position immediately after the report. At the beginning of this letter when I discussed music, I noted that I wasn’t in chorus. Unfortunately, I was in Corus. I underestimated the speed with which digital venues would seize advertising share from Canadian TV networks and overestimated Corus’s bargaining power after its acquisition of Shaw Media. When viewed individually, Retail Food Group (RFG) accounted for almost all the Fund’s loss this year. We purchased the Australian restaurant operator in December amidst a hailstorm of controversy surrounding the firm’s relationships with its franchisees. In our Q417 letter, we remarked that “the stock has recovered some lost ground already.” That victory dance was premature. RFG’s shares were walloped when the company reported semi-annual results in early March. We have rarely witnessed such one-sided media coverage of a company. RFG has legitimate issues, but its management has done a remarkably bad job in addressing false accusations. For example, one of the top news programs in Australia, ABC News, recently claimed that RFG’s franchisees are being gouged, citing as evidence that fees from franchisees were up 27% in 2017, while the sales revenue from those franchisees’ outlets was down 8.4%. They implied that RFG is collecting more fees from franchisees even though the franchisees’ own sales were slipping sharply. The 27% growth referenced in the article is the change in RFG’s overall revenue, not “fees from franchisees” as described by ABC News. RFG’s sales rose 27% in 2017 because the company acquired Hudson Pacific Corporation and formed a new Commercial Food Services division. The vast majority of Hudson’s customers are independent restaurants, cafes, and other foodservice companies that are outside of the RFG franchise network. ABC also noted that sales revenue from franchisees were down 8.4%. This is incorrect and misleading. The 8.4% decrease reflects the overall revenue that RFG received from its Bakery Cafe, QSR Systems, and Coffee Retail Systems segments. This includes corporate stores owned by RFG. Moreover, the decline in these revenues is directly affecting the parent. As franchisees close stores, RFG receives less revenue from royalties. The franchisees’ domestic same store sales averaged +0.9% in fiscal 2017. While this comp isn’t great, it’s a long way from the harrowing declines implied by the slanted media coverage. The barrage of incendiary press coverage has created a self-fulfilling prophecy where the company is struggling to enlist new franchisees. In hindsight, as we were contemplating our entry into the stock, we could have better factored in the potential for adverse publicity to weigh on the business model. We are currently performing additional diligence on this name and will have more to report in our next letter. In addition to Corus Entertainment and Retail Food Group, the Fund’s third largest detractor in the first quarter was Net 1 UEPS Technologies (ticker: UEPS), a South African payment solutions, transaction processing and financial technology company that we also acquired in December. The stock has been burdened for several years by the anticipated loss of Net1’s large legacy welfare distribution contract with the South African government. However, the Constitutional Court of South Africa confirmed the government was unable to take over the distribution of cash payments to welfare recipients by a March 31, 2018, deadline, and it ordered UEPS to continue facilitating these payments for at least six more months. The pricing for these efforts has not been settled. Meanwhile, another South African court ordered UEPS to return $27 million in payments it received in 2014. These payments related to a government request for UEPS to re-register 11 million additional social grant beneficiaries beyond the planned 9.2 million recipients. According to the company, these additional registrations led to the discovery of a significant number of ghost beneficiaries and duplicate grants and saved the South African government more than 2 billion rand per year for the last five years ($850 million USD at current exchange rates). UEPS is appealing the verdict. The South African government is a circus, and UEPS is one of its favorite whipping boys, even though the company has performed its role far better and cheaper than the government ever did. Sadly, the merits of the situation won’t necessarily drive the outcome. Fortunately, it is our view that UEPS’ current stock price is fully supported by the firm’s balance sheet and assets outside of South Africa. Any positive developments for operations inside of that country could drive substantial upside to our estimated intrinsic value. In February, the firm’s Chairman purchased a significant number of UEPS shares on the open market. The Fund’s major success of the quarter was the proposed takeover of Primero Mining by First Majestic Silver (ticker: AG) on January 12, 2018. This announcement sent the price of our convertible notes from the low 60’s to near par value. As we predicted in our Q317 letter, Wheaton Precious Metals (ticker: WPM) agreed to reduce the streaming burden on Primero’s San Dimas mine in return for establishing a relationship with a stronger partner, First Majestic. The deal has been approved by Primero’s shareholders and is expected to close later this month after it is cleared by Mexico’s anti-trust agency. We are confident that the Fund’s inauspicious start to the year is not related to recent market tremors. The names we own often march to the beat of their own drum. In some cases, share price declines cannot be explained by the market or company-specific developments. The Fund’s largest holding, Baldwin & Lyons (ticker: BWINB), sold off throughout the final weeks of the quarter on no news. Baldwin ended Q1 trading at 80% of its tangible book value and 11x the average earnings it produced in the five years through 2016. In contrast, the Russell 2000 is selling for 105x trailing unadjusted earnings. Baldwin is near its 52-week low because of investors’ recency bias. The company posted an underwriting loss in 2017 due to trends affecting all commercial auto insurers. We believe adverse developments peaked last year and Baldwin will deliver improved results going forward. If we are wrong, then we own a firm likely trading at a discount to its theoretical liquidation value. We’ll make friends in low places like Baldwin all day long. In March 2016, the Intrepid Endurance Fund was profiled in an article in The Wall Street Journal that described how mutual funds have held progressively less cash over time. The author described portfolio managers of high cash funds like ours as being “rarer than white rhinos.” On March 20, 2018, the world’s last male northern white rhino died in Kenya at the age of 45. Gulp. While it was nice to be compared to the rare, impressively hulking, and powerful horned animal from Africa, even in the context of recent underperformance, we think many of Intrepid’s investing habits are more aptly related to another creature—the Periplaneta Americana—also known as the mighty cockroach. Nimble. Check. Opportunistic feeder. Check. Repulsive to many. Check. Indestructible. We’d like to think so! For example, to compute the price change for the last data point on the chart, we average the 11 individual changes on the day we bought them as well as the average percentage change of the Russell 2000 on the 11 different days we started buying each holding. Robertson, Andrew. “Franchisees hope Senate inquiry will stop them being ripped off by unscrupulous franchisors.” ABC.net.au/news. 29 March 2018. Web. Accessed 2 April 2018. Zweig, Jason. “Cash is Now a Sin.” The Wall Street Journal. 11 March 2016. Nuwer, Rachel. “Sudan, the Last Male Northern White Rhino, Dies in Kenya.” The New York Times. 20 March 2018. Prior to June 26, 2015, the Fund was named the Intrepid Small Cap Fund. The Morningstar Small Cap Index tracks the performance of U.S. small-cap stocks that fall between 90th and 97th percentile in market capitalization of the investable universe. The Russell 2000 Index consists of the smallest 2,000 companies in a group of 3,000 U.S. companies in the Russell 3000 Index, as ranked by market capitalization. The S&P SmallCap 600 measures the small-cap segment of the U.S. equity market. You cannot invest directly in an index. The South African Rand is the currency of South Africa. Tangible Book Value is is the total net asset value of a company (book value) minus intangible assets and goodwill. Trailing Unadjusted Earnings (Trailing Price-to-Earnings) is calculated by taking the current stock price and dividing it by the trailing earnings per share for the past 12 months. FANGs refer to Facebook, Amazon, Netflix, Google. Correlation is the extent to which the values of different types of investments move in tandem with one another in response to changing economic and market conditions.